Khaled drops a new one for the summer - "No Brainer ". The song reunites Khaled with the same team( Justin Bieber. Chance the Rapper & Quavo ) that dropped the hit song "I'm the one" last year. "No Brainer" is slated to appear in Khaled's forth coming album "Father of Asahd". 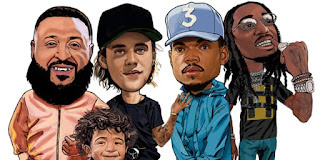 With Khaled's exceptional heart pumping instrumentals, Bieber's vocals, Chance and Quavo 's rap lyrics, "No Brainer" is the perfect song for the summer. with Khaled and his family posing as directors on a film set. "No Brainer " is the song to be on everyone's playlist (on repeat) for the summer and beyond.